When it comes to protecting yourself online -- particularly when surfing through insecure public connections -- then nothing beats a good old VPN. Virtual Private Networks create encrypted tunnels in which you can surf the web, check your email and connect to remote networks secure in the knowledge you can’t be hacked. 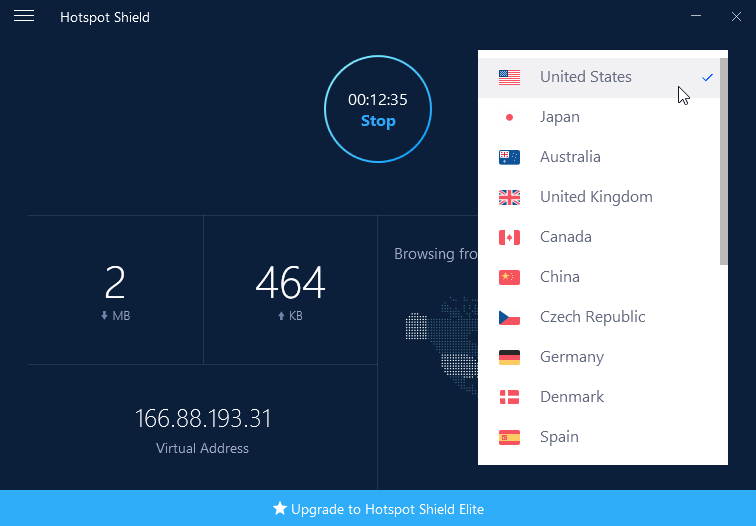 If you’re a Windows user, then the recently released Hotspot Shield 7.1.2 may appeal, offering a free, ad-supported (and bandwidth-limited) way of connecting via VPN. Hotspot Shield 7.0 allows you to take full advantage of everything a VPN has to offer. There’s the aforementioned encryption of course, but another advantage of VPNs is that they route your connection through remote servers. This means you can surf anonymously and also mask your true location, allowing you to access services normally restricted by country. Many of Hotspot Shield’s best features are -- sadly -- hidden behind an Elite subscription. On first launch, you’re prompted to start a 7-day trial, which requires you to enter your credit card details. Hit back a couple of times, though, and the free version starts. Click the button to connect and you’ll be given a virtual IP address and told you’re browsing from the United States. Click this drop-down menu to select another location, and you’ll be told you need to upgrade. Prices start from $12.99 a month, with prices falling by half if you’re prepared to pay for a year upfront. Other benefits of upgrading include the fact your subscription covers multiple devices and computers, no bandwidth limits and an end to ads. Hotspot Shield will appeal mostly to those on the road a lot, particularly those looking to access geo-restricted content when away from home. But check out rival services -- CyberGhost VPN offers a free version that disconnects you after three hours and limits bandwidth, but offers you a choice of 12 countries when selecting a location for example. Version 7.0 of Hotspot Shield debuted a new and improved user interface, plus added in-app sign-in for those with paid-for Elite subscriptions. Hotspot Shield can now be toggled on and off with a single button from its home screen, while Protection modes have been retired in favor of a simple automatically auto-on setting for networks and sites. This auto-on setting means users can easily define networks as a safe, unsafe or other -- it means Hotspot Shield switches itself on automatically when you connect to a public network for the first time, while disabling itself when you next log on somewhere trusted, such as your home network. One final new feature is the "kill switch", which when enabled disconnects your internet connection if Hotspot Shield becomes unavailable, helping protect against outside attack. Hotspot Shield 7.1.2 is available now as a free download for PCs running Windows 7 or later; other platforms are also supported. Advanced features require an Elite subscription.